Rita is a full tea length gown in spot tulle and embroidered lace, with a wide scalloped v neckline which sits on the tip of the shoulders and continues into a stunning v back. A thin satin bow belt highlights the waist and the delicate full length sleeve with scalloped cuffs finish off this vintage inspired look. A vintage, tea length wedding gown. Subtle gold lace appliques add a lovely warmth to this 1950’s style. How lovely are the sheer lace sleeves and pretty V-back. 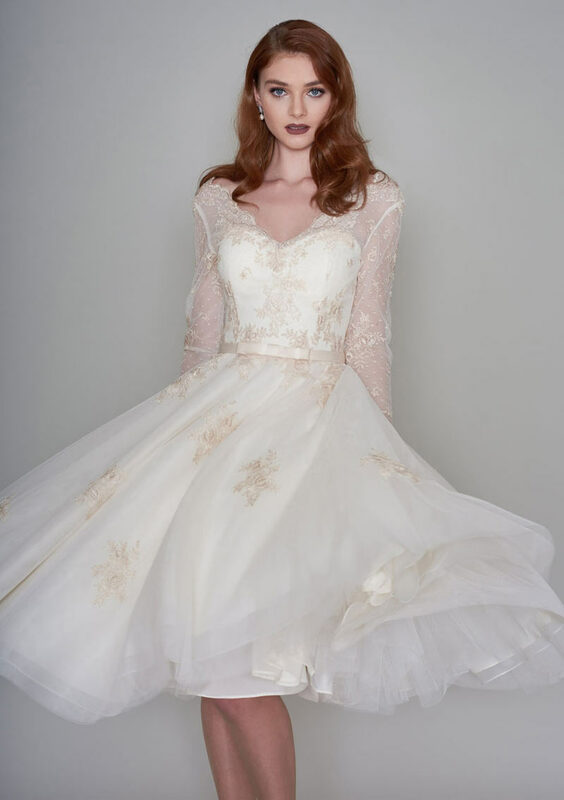 This LouLou wedding dress has a unique vintage style.